Nick Farr Jones and his Wallabies were desperate to play the Springboks when they arrived in South Africa in August 1992; Australia had not toured the Republic in 23 years, and the Springboks had been absent from the Test arena for more than a decade as a result of the nation's Apartheid-related exile. South Africa, then, was changing. Two years had passed since Nelson Mandela's release from Robben Island, and Apartheid had officially ended in 1991, but racial and political tension continued to shroud the nation. Only two months before the Wallabies boarded their plane to cross the Indian Ocean, those tensions reached boiling point when 46 people died in the Boipathong Massacre, a clash between representatives of the African National Congress (ANC) and the Inkatha Freedom Party. The fallout from the massacre had the potential to derail far more than a historic rugby tour, but the Wallabies, led by Farr Jones, with the backing of the ANC - led by Mandela - were to travel while security risks were monitored. "We wanted to play a Test match against South Africa," Farr Jones told ESPN. "We were desperate to play them. They weren't part of the 1991 World Cup. I as the captain … I wanted to monitor the security risk. There had been a lot of issues, and the last one that happened a few months before we went to South Africa, was a township of Boipatong. There were a lot of security risks. So as captain and representation of the team, I wanted to make sure the security was OK. But we couldn't wait to play South Africa." Arriving in South Africa in early August, the Wallabies were invited to what ESPN columnist Greg Growden described as "one of the most extraordinary and unexpected politics-meets-sports gatherings ever organised". The Wallabies, alongside the All Blacks, who were also in the country to play the Springboks, joined South African President F.W. de Klerk, ANC sport spokesman Steve Tshwete and Chief Mangosuthu Buthelezi of the Inkatha Freedom Party for a function in a gold mine beneath Johannesburg. The political tone of the tour then continued, with several Australian players and officials, including Farr Jones, invited days later to a meeting with then ANC chief Mandela, whom they presented with a Wallabies cap. Mandela gave the Australian officials his personal endorsement of the tour, all with the small yellow hat perched on his head. "We met with F.W de Klerk, we met the Zulu President Chief Mangosuthu Gatsha Buthelezi.," Farr Jones said. "They were all amazing people, I have no idea how the meetings came about, but they just happened. "I met Mandela on a number of occasions. He was an amazing man. What he did once he became president in 1994 to unify that country. To use the 1995 World Cup and that team, to create what became known as the Rainbow Nation, was amazing. He truly understood forgiveness." And forgiveness was necessary when tensions rose again a week before the Wallabies were to take the field against the Springboks, after South African rugby officials breached one of the conditions for ANC support for the All Blacks' and Wallabies' tour of South Africa. "The ANC insisted in supporting the tours that there were three conditions," Farr Jones said. "The non-waving of the old Dutch flag; the second was the non-playing of the old Die Stem, which was the Dutch South African Anthem; and the third was the observance of a minute silence for the victims of township violence, which included Boipatong, the most recent before we went. "When we went to Ellis Park the week before we were due to play our Test, those conditions were breached." As the Springboks and All Blacks ran onto Ellis Park for the return Test, many were shocked when South African officials allowed the Die Stem anthem to be played. The act caused the ANC to threaten to remove their support for the Wallabies Test, which meant there would be no guarantee of player safety. Two nations became one when Nelson Mandela strode to the centre of the pitch in a Springboks jersey and shook hands with Francois Pienaar, and Oscar winner Morgan Freeman tell the emotional story of that cornerstone moment and what it meant to South Africa's healing process in The 16th Man. Watch The 16th Man in Australia on ESPN on June 24 at 7am (EST) and 11pm (EST), and on ESPN2 at 5pm (EST). "We wanted to play a Test match against South Africa, but we were not going to stay around if the ANC withdrew their support," Farr Jones said. "The team were advised that we basically had Plan B in place. The Tuesday morning after the All Black Test, the ANC met to consider withdrawing support. "So basically we woke the guys on Tuesday morning having had a 1am meeting between [ARU] president, ARU CEO, coach and captain; when we heard the ANC were reconvening to consider withdrawing support, we woke the guys up, we said 'guys we're going to training but pack your bags, if they withdraw their support we're out of there'. We had contingencies in place, we had a plane waiting for us to get us out of there. There would have been a huge amount of security issues, and it would have been unwise [to stay]. "But there was a great guy, who became Sports Minister under Mandela; his name was Steve Tshwete. He was the one who basically convinced his colleagues and the African National Congress to give the crowds, the supporters, one more chance. And that's how we got to play our Test." After a tumultuous week, including a 2am press conference in ARU president Joe French's Port Elizabeth Hotel room, the ANC conceded and allowed the Test to go ahead and Farr Jones's Wallabies side finally played the Springboks in front of a 43,000-strong crowd at Newlands Stadium in Cape Town. Farr Jones reflected that "Cape Town is a totally different environment to say Pretoria or Johannesburg, where you're dominated by the Afrikaners and what have you; Cape Town is full of people who were supporting us in those days". Three years later, when the Republic hosted what would become one of the most memorable sporting moments in history, the nation had changed dramatically and the Springboks had the support of all South Africans - even in Cape Town. "It was quite amazingly different," Farr Jones said, sure the influence of one man had paved the way for the Rainbow Nation. "You put it down to the influence of the President. When the rest of his party to a person was insisting on getting rid of the Springbok logo from the jersey, he fully understood the need to reconcile with the people who were his previous enemy. You had the white and the Afrikaners who loved their rugby and that Springbok logo. And he said 'look we have to understand what our former enemies cherish, and that's the Springbok and so we keep that; we had a Protea, but if we want to get true reconciliation in this nation we keep the Springbok logo'. 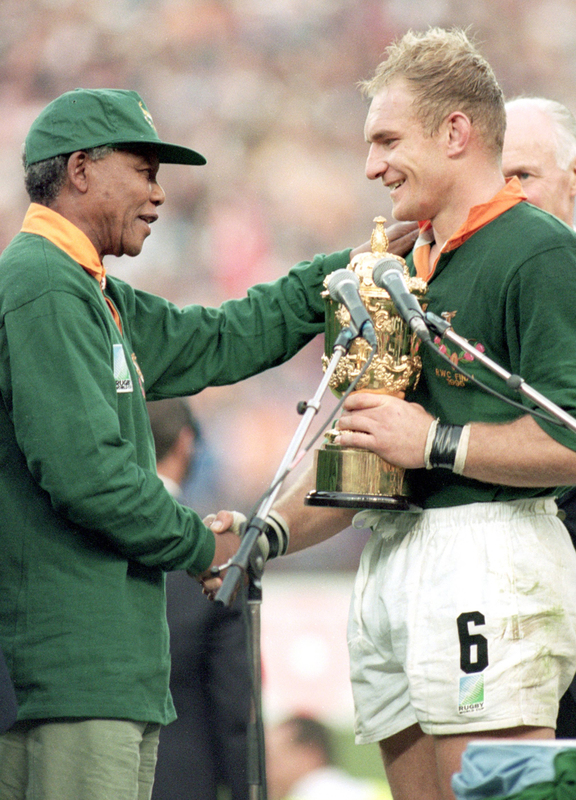 Mandela's proposal to accept the Springbok logo, while adding the protea, the national flower of South Africa, ultimately paved the way for a nation to achieve reconciliation and reunification in what Farr Jones described as the "defining moment" when the president wore Francois Pienaar's jumper at the final. "You know Mandela in his days in prison would always support anyone who played against the Springboks, and that was the amazing thing about the transition that he led," Farr Jones told ESPN. "All of a sudden he got behind Francois Pienaar's team and encouraged all the black and coloured people to get behind 1995 World Cup, and it was a phenomenal success." Pienaar said of the moment, 20 years ago, when Mandela wore the Springboks jumper at Ellis Park that "no Hollywood scriptwriter could have written a better script"; and he was right, even as the moment marked the beginning of a journey rather than the end. 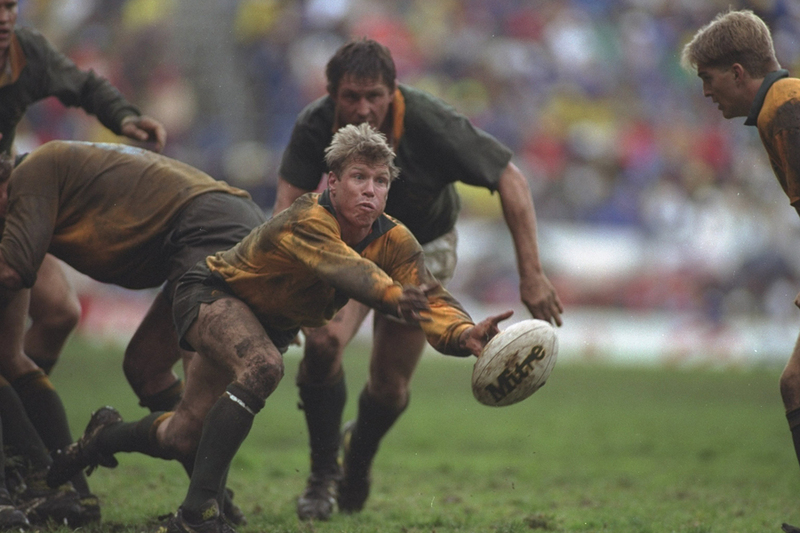 Features: Is South Africa the Rainbow Nation 20 years after Rugby World Cup glory?